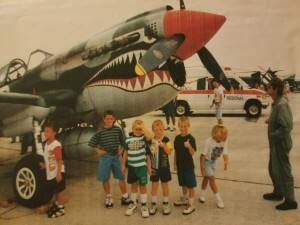 Wes Alberts (in green), with the P-51 Mustang that helped spark his interest in flying. Wes Alberts, in Flight Test Operations, remembers the first time aviation made a big impression on him. It was at an air show in middle Tennessee, where it just so happened The U.S. Navy Blue Angels were performing. “My grandfather took us. He was a loadmaster and a crew chief on C-130s for the Tennessee Air National Guard. It really sparked my interest. I remember seeing a P-51 Mustang with a really cool paint job. I was six or seven years old,” Wes said. For many years to follow, Wes enjoyed attending air shows, but never thought of aviation as a possible career choice, until a meteorology professor suggested it. “My meteorology professor noticed my interest in planes and told me that meteorology and flying often go hand-in- hand. As a pilot himself, he took me up one afternoon to show me what it was all about. Although I had been in planes before, this was the first time I had been behind the controls. It was at that moment that I knew this was the career field I wanted to pursue. I quickly started focusing on aviation, and began taking flying lessons,” he said. Soon, Wes had transferred to Middle Tennessee State University for their strong aerospace and professional pilot program, with a minor in air traffic control. While there, he earned his pilot ratings, and after graduation he flew professionally for the better part of two years for a company that provides expedited transport of donor organs. “I mostly flew in the southeast, because every organ has a limited life outside the body. The liver is 24 hours, a heart is two. With blood samples, we might fly as far as Pennsylvania,” Wes explained. His next job as a pilot also involved a lot of night flying. It was under contract to the U.S. Department of Defense, flying Jetstream 41s from stateside locations. He would fly trainees for various service branches all along the eastern coast of the United States. When defense contracts waned, Wes spent two years out of aviation with a civil engineering firm in his native Tennessee, but he never took his eye off opportunities in aerospace. 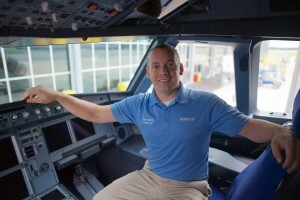 One day, on his lunch hour, Wes saw an advertised job with Airbus in Flight Test Operations. That afternoon, he went home and asked his wife, Kristin, what she thought about moving to Mobile, Alabama. After a few weeks, the phone rang. An interview by phone and a face-to-face with Jean Paul Juery, Thierry Cros, and Patrick Duche followed. A few days later, Wes was offered the job. Although they had a young child, and months of training in Europe lay ahead, Wes and his wife agreed the sacrifice would be worth it to attain a dream job at age 26. After training in both Hamburg and Toulouse, Wes joined the FAL in December 2015, and he hasn’t looked back. Although his primary focus is in Mobile, Wes particularly enjoys working on the developmental fleet throughout the Americas. “We do a lot of developmental flight test operations for all of North and South America. The job has taken me everywhere. Most recently to Chicago, and to Canada, and the McKinley Climatic Laboratory hangar at Eglin Air Force Base where it can get as cold as -40 degrees Fahrenheit,” Wes said. What does Wes love most about his job? “We’re always thinking about the safety aspect, because the majority of the flight systems have not been tested until we test them, but we have confidence in our colleagues in the FAL, and we have confidence in our own team, that everyone will do what needs to be done,” he said. That extraordinary spirit of teamwork is a part of the reason Wes says Airbus was the turning point in his career. “I feel like I’ve gotten to where I wanted to be at this point in my life, and I couldn’t ask for anything better. That came with a lot of sacrifices, but its sacrifices my family and I made together, and it’s turned out to be really good for our future,” he said. When he’s not working in Flight Test Operations, Wes Alberts likes taking his family out in the boat: fishing, cruising, or just pulling up to an island for a picnic.